Are you looking to connect with the natural world on New Year’s Day? Take a break from the rush of the holidays to start the year with clear, crisp air and wide views. Check out these nearby options for enjoying a guided “first hike” on New Year’s Day. Be sure to dress very warmly with layers, wear boots, and bring water. Lip balm is especially nice to have in dry cold conditions. In the event of ice or snow, participants should bring additional appropriate gear. If you’re unsure, call ahead to the rangers at any one of these parks to get some guidance! A ranger-led hike along 1.5 miles of the Profile Train inside Grandfather Mountain State Park. This is a great way to kick off the new year with a breath of fresh mountain air! For all ages, no pets, please. This is a moderate hike. However, depending on the weather conditions, it can be more challenging and difficult for some. Free to participate, meet at the Profile Trail parking area on Hwy 105 near Banner Elk at 1pm. 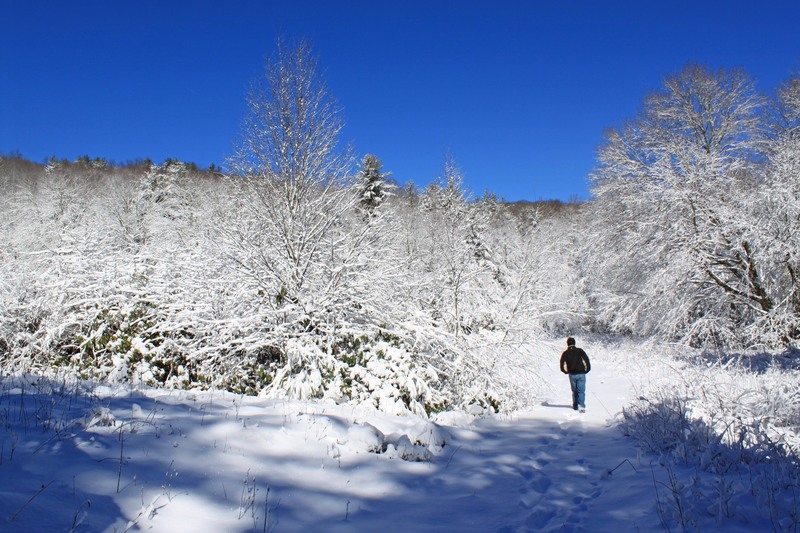 This one-mile hike is inside Elk Knob State Park north of Boone. The hike will be weather dependent, so check ahead before visiting the park. Meet a ranger at the trail head parking lot inside the park at 11am. This moderate, one-mile round trip hike is in Mount Jefferson State Natural Area in West Jefferson. The ridgeline hike heads to Luther Rock, which gives wide views of the surrounding area. Meet a ranger at 2pm at the parking area at the top. This 1.5 mile hike takes participants to the waterside in New River State Park in Laurel Springs. The many trails of the park meander from the river’s edge to the top of the rolling hills of North Carolina’s High Country. This moderate hike will begin at 10am at the Park’s visitor center. Ring in an epic New Year on Grandfather Mountain with the first sunrise of 2018. On Monday, Jan. 1, the attraction will host another New Year’s Sunrise event, offering guests the chance to start off their new year on a literal high note. Plus, attendees will be able to join in a community breakfast buffet with their fellow early risers. Sunrise is at 7:38 a.m. on Jan. 1, 2018, and Grandfather’s gates will open at 6:30 a.m. Extra admission applies, and the event is open only to 100 people. Registration is required. To register, contact Judi Sawyer at (828) 733-2013 or judi@grandfather.com.